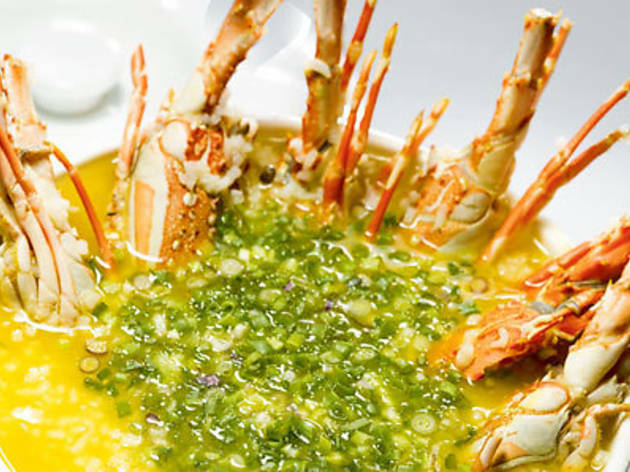 While the restaurant’s name translates to ‘house of lobster porridge’, the offerings are not limited to this shellfish-based congee – this is only one of almost 40 dishes featured on the menu. Those looking to crack open claws and dig for meaty treasure can pick from a menu that features this piscatorial delicacy prepared in ten ways – think flat-bean noodles in superior stock or with mee sua (vermicelli). Long Xia Zhou Shi Jia joins the bevy of restaurants that sit pretty at the glitzy Orchard Central mall. And while you might have heard rumours that the mall’s retail tenants were suffering from sluggish traffic flow, this joint was decidedly full during our visit on a Sunday evening. It may help that the resident chef, Lau Siaw Dee, took home an international culinary award for his lobster porridge. 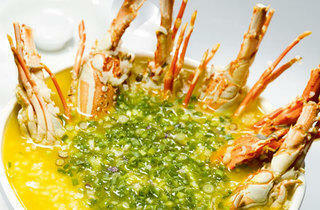 For us, the restaurant’s trump card lies in its lobster-laced creations. The gargantuan bowls of fragrant shellfish and chicken stockenriched gruel crowned with hunks of shell-on lobsters left our palate begging for more umami-flushed consomme, as it did for the pristine slivers of sweet lobster flesh. On a shoestring budget? The sliced fish fillet in a savoury chicken and fish bones-enriched consomme made a pleasing alternative for just $18. Other signature dishes we sampled include the deep-fried, egg-dusted lotus root starter, and fried Kurobuta pork doused in a sweet and sour sauce – both deserve a place on your table.